Wisconsin is finally get its first IKEA, and I’m SO excited we’ll have one close by! I was lucky enough to get a sneak peek of the new Milwaukee (Oak Creek) store last week, and guys, it’s GOOD! We toured through the whole store. There are about a million (okay, or 50!) cool rooms set up. It took a team 14 weeks to get all of that set up! What a fun job would that be?! When IKEA goes into a new market, the team meets with a local historian to learn all about the area, the culture and how people there live. It was so interesting to hear how that affects the store setup! Finished basements and fireplaces are common in Milwaukee, so some of the in-store room setups had faux stairs (like they were leading upstairs) and fireplaces. I love those touches! IKEA does a great job of showing you how to maximize a living space and how to decorate with their pieces in different ways throughout the store – like using this rod to hang plants or using pegboard for organization in a nursery (picture of that below). They also had a few different setups with “Create this room for $x,” which was fun to see just how much you could spend to get a whole room design. I love that. They’ve really thought about what makes shopping easiest on the customer and what people leading different lifestyles are looking at for their homes. It was interesting to hear all about the thought they put into store and product design. Even if you’re not in Milwaukee, it’s always fun to hear what’s new at IKEA, right?! The kitchen section was also AWESOME! I had no idea since there wasn’t an IKEA here when we did our kitchen renovation. They have a ton of cabinet and counter (including quartz!) options. Definitely worth looking at if you’re planning a kitchen renovation. How easy would it be to stay organized with drawers like this?! Oh and they had a wooden toolbox with green and clear glass bottles – just like our patio centerpiece last year! I love it. OMG, the faux plant section was unreal. I want to go back and buy them all. They actually look real, not like those fake rubbery plants you see sometimes. There were so many good art prints and photos perfect for wall decor. I love these frames. I want to do a gallery wall of some sort on our stairs, and I’m thinking these frames are perfect for it. I really liked all of the maps, too. There were so many good light fixtures and lamps. I looooove this light. The smart lighting options were really cool. You can set lights to be dimmable without even hard wiring them! I always get asked about the crates in our living room, and since they were a Marshall’s find, I never have a link for anyone! 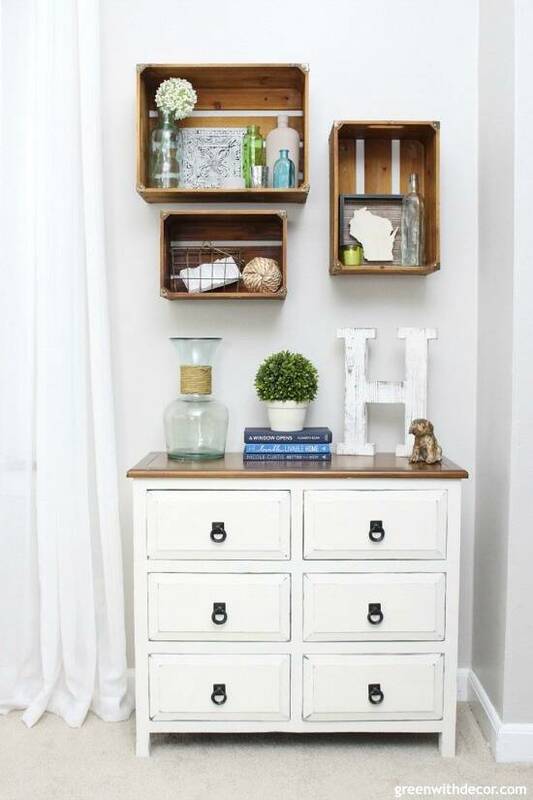 IKEA has these pretty crates you could stain or paint and then hang on the wall just like ours. Of course I have to mention throw pillows. I loved this gray one with the buttons. I was amazed at all of the rugs they had. So many pretty neutral and colorful options. Isn’t this cute and perfect if you have a little patio or balcony?! Doesn’t everyone own one of these?! I feel like it. They have so many size and color options now! These baskets fit inside perfectly, we just may need to grab a few of these for easy storage. The pet section is newer, and it was so cute! I wanted to bring home all sorts of fun things for Oakley. They had a lot of cute stuff. I love this pegboard idea for nursery organization. And the play kitchen is so cute! We’ll definitely be back when we plan a playroom. We got to try out the breakfast. I’m not the biggest breakfast person so didn’t have the highest expectations (I was there for the decor! ), but it was DELICIOUS. We had potato pancakes with jam, yogurt with blueberry and raspberry jam (a recipe originally made for the Sweedish queen! ), sponge cake with strawberries, cheese (try the Präst! ), deviled eggs, beet salad and more. YUM, it was all so good. And they have a cool coffee machine where you can brew your own latte. It was delicious! Plus the Milwaukee store has the largest Sweedish market (near the checkout) so you can buy all sorts of food to take home. If you like chocolate, you HAVE to get the Marabou chocolate. It’s delicious. If you’re in Milwaukee, the store opens tomorrow at 9 a.m., and, if you’re feeling brave, the parking lot opens at 5 a.m! The first 1,000 adults get a welcome gift, and there will be all sorts of prizes and giveaways (including gift cards) going on all day. Have you scored any fun IKEA finds lately? I’d love to hear! Fun! You’ll be so glad to have an IKEA nearby! It’s always my favorite. I’m so excited to have one close!! I’m in the Milwaukee area too, so im excited, as well. I will NOT be going to the opening tomorrow. I can only imagine that craziness!! That is awesome, I could spend ALL DAY at Ikea! I could, too! So many good things! IKEA is such a fun and fantastic place to shop. You are lucky to have one so close by! It really is! I’m so glad to have one close! I LOVE Ikea! Our closest one is 2 hours away but it is always worth the drive!! I love all those rooms and the decor but you know I am all about the food too! 🙂 the food looks amazing!! Ours used to be about that far, too! The food was SO good! I had no idea they met with local historians to learn more about the area! That’s so cool. I always love to browse IKEA and get inspired for decorating and organizing our home. I have some serious faux plant envy – I don’t remember our IKEA faux plant section being that awesome when I was there a couple months ago. Isn’t that cool about the historians?! I find stuff like that so interesting, haha! The faux plant section is GOOD, I’m going back to stock up!